MOVEit Cloud gives you the management tools and visibility you need to scale transfer activities to meet your business needs. Ensure the secure and reliable transfer of business-critical data. 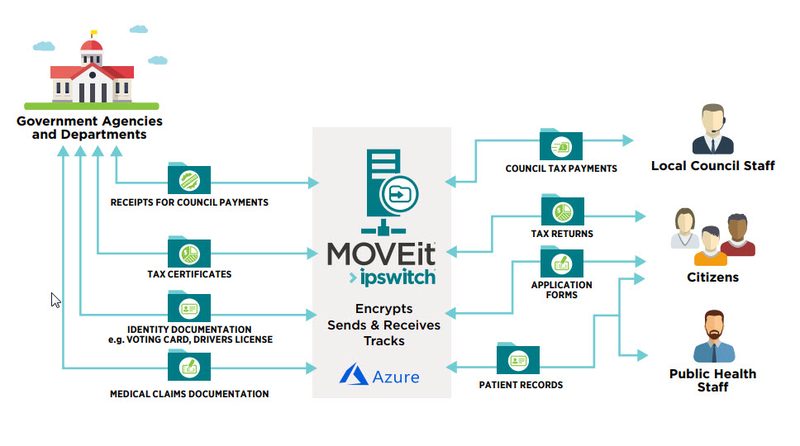 MOVEit Cloud is certified PCI and HIPAA compliant and GDPR ready. Eliminate time spent managing software and security updates. Enjoy best in class security and the reliability of 99.9% uptime. Let our experts focus on maintaining a best in class software deployment. Stay current on the latest security updates and layers of defense including FIPS 140-2 certified cryptography, access control, integrity checking, penetration testing and more. View and control transfer activity by file and user, not just at the folder level. Single sign-on capability is available via SAML integration to Identity Provider systems. Integrate with in-house applications and provisioning services. Scale managed file transfer costs with business demand. Proprietary and REST APIs allow access to MOVEit Cloud services and administrative capabilities to improve web application integration and enable automated account provisioning. Match costs to usage and eliminate operational costs associated with on site hardware, software maintenance, and support. Use the elasticity and rapid deployment features of the cloud to quickly satisfy peaks in demand. MOVEit Cloud is PCI DSS 3.1 Level 1 certified and ready to ensure GDPR compliance Annual subscription based GDPR and PCI Compliance toolkits provide tools and assistance to support regulatory compliance documentation. The kits include reports containing the MOVEit Cloud assessment results for review by independent auditors as well as compliance reporting templates and access to our experts to answer questions regarding security and controls. MOVEit Cloud is hosted in EU-based data centers. Fast Notification and Simple Retrieval of Files Recipients are sent an email notification the instant a MOVEit user sends them a file or a secure message. The email notification includes an embedded link to securely download the file or files, an optional note from the sender, and password requirements. This email message can be viewed in any email client or Webmail application, and the recipient only has to click the embedded link to access the files. Recipients can also securely send files of any size back to the original sender. File recipients can retrieve files from their preferred Web browser – including Internet Explorer, Firefox, Safari for OSX, or Chrome – without the need to install any plug-ins or additional third-party software. Recipients don’t even need to be a MOVEit user to be able to receive the file packages. Quickly and Securely Send Files and Messages to Other People With MOVEit Ad Hoc Transfer, authorized MOVEit users can securely transfer files or folders of files of any size and send secure messages to anyone in the world using either a Web browser or Microsoft Outlook. Users can send a package of files along with an optional secure message to an unlimited number of recipients – even those who are not MOVEit users. Receivers that are not currently configured can be optionally and automatically added to the system based on IT requirements for user expiration, password length, complexity and delivery requirements with no IT involvement. If configured, senders can easily customize security controls by creating recipient passwords as well as file expiration and download limits. Senders can also “recall” files after they have been sent so they are no longer available for download. If you'd like to have a chat with us about MOVEit Cloud, please select this option. If you'd prefer to email or phone us, our details are also here.